Did you know that women spend a lifetime average of 72 days shaving their legs? If that seems like a terrible way to waste nearly three months of your life, why not get laser hair removal treatments and give up your razor for good? At L-Aesthetics & Longevity, in Bee Cave, Texas, Billy Ledbetter, MD, and his team provide laser hair removal services using the Sciton® laser system. Call or schedule a consultation online today to learn more about laser hair removal and how you can have smooth, hair-free skin. 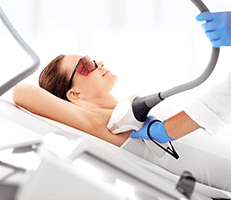 Laser hair removal works by sending a beam of laser energy into your hair follicles, where it converts to heat and destroys the hair follicle to prevent future hair growth. Your hair grows in cycles, and the follicles must be targeted during the growth phase. As a result, most patients have a series of six laser hair removal sessions spaced 4-6 weeks apart to achieve optimal results. If you’ve been waxing, you need to revert to shaving for six weeks before you start laser hair removal to ensure there is some hair in the follicle for the laser to target. During your laser hair removal treatments, you and your aesthetic provider wear goggles to protect your eyes. You disrobe enough to reveal the body area being treated and rest on a treatment table. Then your aesthetic specialist uses the Sciton handheld device to direct the laser toward your skin. Many patients compare the sensation to a snap from a rubber band or mild burning feeling that subsides soon after the treatment is complete. Your aesthetic provider can give you ice packs to soothe your skin. If your skin is sensitive, you can also apply a topical numbing cream about a half hour before your appointment to reduce any discomfort. Do I need to do anything special to take care of my skin after laser hair removal? After your treatment, you need to avoid strenuous physical activity for 24 hours. While wearing sunscreen is always important, you should also take care to avoid the sun while you’re having laser hair removal sessions. A tan creates extra melanin in your skin which could disrupt the effectiveness of your treatments or cause unwanted side effects like hyperpigmentation. Call or schedule an appointment online today to learn more about laser hair removal and start your journey toward a hair-free life.